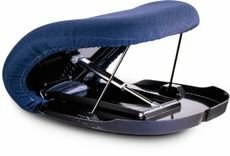 Upeasy UPE-1 Seat Assist helps you stay active and independent. With up to 70% lift assistance for those up to 350 lbs., Upeasy Seat Assists are self-powered and lightweight. They travel wherever help is needed to get in and out of your chair. Why people choose the UpEasy UPE-1, UPE 1 Seat Assist by Uplift Technologies. This economy unit has polyurethane foam and a washable cover.